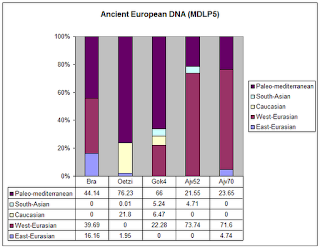 In the Bronze Indo-European invasion of Europe I compiled the assessment of different ancient autosomal DNA data from Europe using tools developed by the Dodecad Project. I thought it might be a good idea to do the same using a different calculator, the DIYHarappaWorld. 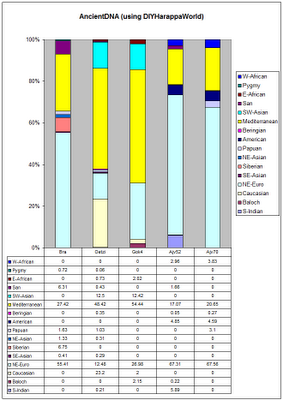 The results are shown on the left, and should be compared against the HarrapaWorld Admixture spreadsheet. I am not very familiar with the HW components, and you should not assume that similarly named Dodecad and HarappaWorld components reflect the same entities. This is probably due to probable differences in data (e.g. lots more West Eurasian vs. South Asian participants) and methodology between the two projects. Nonetheless, I would say that these results largely confirm the "Mediterranean" character of the "farmers" Gok4 and Oetzi from Italy and Sweden and the "North European" character of the hunter-gatherers Ajv52, Ajv70, and Bra from Sweden and Iberia. I glanced through the the HW spreadsheet, and it seems that even small discrepancies, e.g., Oetzi's 12% NE_Euro from DIYHarappaWorld vs. the 0% North_European from Dodecad K12b are consistent: note that Sardinians, the most Oetzi-like population have a similar 12% NE_Euro in the HarappaWorld spreadsheet, and 0% in the Dodecad K12b one. Hence, this is probably a case of different anchoring of the similarly named components in the two projects, rather than a manifestation of different results of the ancient samples vis a vis modern populations. DIYHarappaWorld, like K12b, is a high-resolution calculator, and hence does not show the clear absence of the West_Asian component in prehistoric Europeans; this component spans the West Asian highlands, and is replaced in both calculators by the twin Caucasus and Gedrosia/Baloch component that are much more localized in their respective areas. 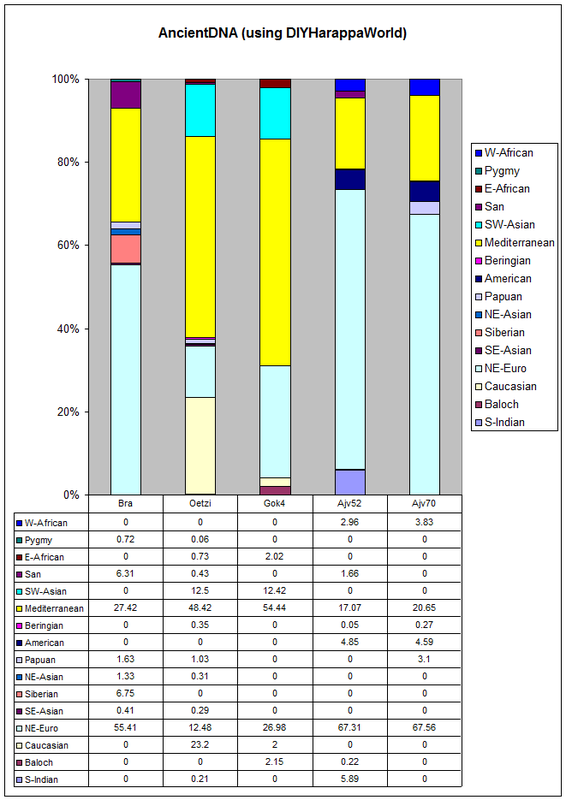 Even though both Caucasus and Gedrosia/Baloch are related to-, the are not equivalent to the West_Asian component; for example, the K12b Caucasus component includes both the K7b West_Asian and Southern in the local blend of the Caucasus, and this explains the paradox that Oetzi has no West_Asian but 1/5 Caucasus. I have also tried the MDLP5 calculator on the same data (on the right). I was not able to find population average data for this calculator, but it seems that the difference between farmers and hunter-gatherers is captured by the "Paleo-mediterranean" vs. "West-Eurasian" dichotomy. Overall, I think this was a worthy exercise which largely confirmed the picture drawn from the original papers and my application of the Dodecad calculators over their data. It certainly seems now that a Mesolithic, North-European-like substratum experienced gene flow from a Mediterranean, South-European-like population that conveyed the new agricultural way of life during the Neolithic. Hopefully, we will get new data from the last 4-5 thousand years before too long, so that my hypothesis about the Indo-European mediated final formation of the European population during that period can be tested. I can send you the population average data for MDLP5, if you still need it. You can post the link here if you want. The oldest sample (Bra) is showing connections to the oldest Africans (San and Pygmy). Perhaps this just reflects the time of connection to Africa and the kinds of ethicities available at the time). The Swedish hunter-gatherers (AJs) are showing the expected West African up via Gibralter. The GOK/Oetzi are showing unexpected East African. Perhaps this is an indicator of where they connected with Africa most recently (eg Middle East). The Swedish hunter gatherers (AJs) are also showing America and a lesser amount of Beringia, No NE Asia or Siberia. I think this means they have connected to America via Iceland rather than asia. Bra shows Siberia and NE Asia. I think this is a reflection of its age, in a similar way to the San connection. It looks like the Balochi (West Asian) might be entering Western Europe from the north (only appearing in Swedes). The Papuan and SE Asian is flowing along the southern coast (in Bra and Oetzi but not the Swedes). I think that Harappaworld Ad-Mix Utilities isn't that correct in the oracle 4 mode in my case. The first one inder ''using 2 populations approximation'' is far from correct, how is this possible? ?